I know that I am not alone in taking off a bite too big to chew with my New Year’s goals. About 10 years ago, I stopped making resolutions and began making goals instead. This has its pros and cons. I am more likely to complete my goals, but I also don’t just stop at one. I am a naturally active person, so I like to pack in my plenty of opportunity for growth in the upcoming year. My creative goals may have topped the cake. This week as I managed my family, my Facebook pages, the monthly creativity challenge, several groups, my employment, the holiday, an online class, and The Artist Way program, I felt that my world was spinning. I wasn’t sure how I would keep up on it all. 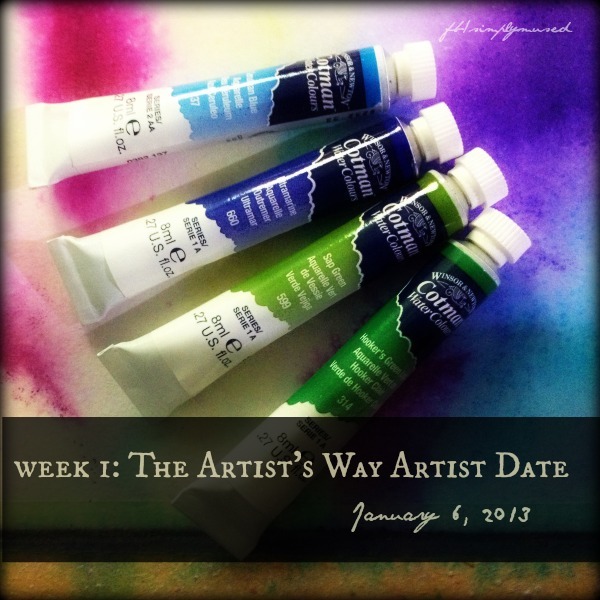 To be honest, by day four, I had no plan for my Artist Date set in stone. My artist child is pretty spoiled (so I thought) and likes going somewhere fabulous on these outings, but after getting off work late I asked what my artist child really needed and received the answer that she just wanted a little special time. She would love to go to the health food market and pick up some fresh produce and would also love to go to the art supply store to pick up the remaining supplies for her mixed media journaling class. Turns out, my artist child is not as demanding as I thought. I had a relaxing outing and came home feeling refreshed. Maybe next week my date with her will be more “creative” but, maybe not. This entry was posted in Artist's Date and tagged art, arts, creativity, goals, mixed media, resolution. Bookmark the permalink. What a great and gentle way to handle the artist’s date. Giving yourself permission to just do something that feels good, without any pressure to make it “great” ! Very helpful to keep in mind the nurturing aspect of the Artist date; Looking forward to following you on your journey. Thank you! I believe being kind to oneself produces great results in personal growth. what a lovely date. Sounds just like my cuppa tea, add a handmade market and woohoo,bliss! All the comments are very fun to read,i was rllaey enjoying reading all the comments,everyone has a different answer but all of them are a believer and they all have a favorites and choice.I was rllaey glad that i was be able to read this article,Such a great post.I rllaey love it.But before anything else here’s also my answer:1.I could rllaey say that I become a believer at the retreat at the church near our place,i was at the 4th grade that time and we also have a subject about religion 2.Right now i like David Cook & The Script ..3.Meal?I love what my mom cooks for me ..Such a lovely post.